Why Miss Homemade? It was a nickname given to me years ago because I love to cook from scratch. Did you know that cooking meals from scratch is usually much healthier than eating processed convenience food? Did you know that cooking from home will save you money? When you are cooking easy meals from home, you will know exactly what ingredients you have put into your food. It doesn't mean that you will be chained all day to your kitchen - however; by making easy meals from scratch many people discover a new found love of cooking. Some folks who never cook meals at home are used to grabbing frozen food and eating take-out. It may seem daunting and time consuming, but the best approach to cooking at home from scratch is to start small. What I suggest is this: decide what you are going to cook for one or two meals a week from fresh ingredients. Do you have a favorite restaurant or take-out meal? I have recipes available that are free and easy to prepare listed in my website that you will love. If you cannot find what you are looking for just send me a email. One secret to cooking homemade meals at home and saving money is to look through the Sunday paper ads of your favorite supermarket and plan meals around the sales. Shop for fresh ingredients that you will need and carefully follow the recipe closely. Don't beat yourself up if it isn't perfect - cooking from scratch is perfected by trial and error; and once you master two of your favorite meals try out another. Before you know it, you will be cooking a wonderful and delicious meal every night - and don't forget, have fun. Two items that I suggest here will also save you a lot of cash over time. The money that you save from making meals at home should be applied to purchasing a freezer. When the grocery store has an unbelievable sale on meat or chicken, you can purchase in bulk and freeze the food until you need it. The other item is a food-saver. This appliance has saved me thousand's of dollars and is very simple to use. You may double a recipe and the left overs are sealed and placed in the freezer for another meal when you are in a hurry and do not have the time to prepare a meal. Or when you purchase meat or chicken in bulk - seal the meat with your food-saver and place in the freezer; meat and chicken will last months longer that traditional freezing and will taste just as fresh as the day you purchased it. Vegetable Oil - I use canola and extra-virgin olive oil in all of my recipes. 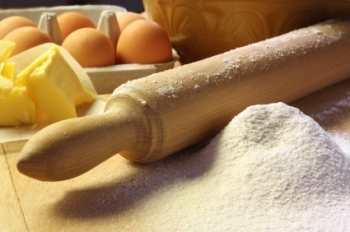 Flour - I have all purpose and cake flour in my cupboard. You may also stock baking powder and baking soda for making cakes and cookies. Mustard/Ketchup/Mayonnaise - I have many condiment recipes made from scratch listed here on my website for you to try. They are simple to make and delicious. (tastes MUCH better than store-bought, and better for you too). You will save hundreds of dollars making your own. Canned Tomatoes and Tomato Paste - Wonderful to have on hand and you may purchase all of the above staples with the "generic" label to save money. Most of these items are made in the same factory; just the labeling is different. My website is called Miss Homemade for a reason - I have recipes for tomato paste, stewed tomatoes, tomato sauce from scratch and so much more. Chicken, Beef or Vegetable Stock are convenient to have. I keep "Better Than Bouillon" in Chicken and Beef base - just add to water. It's less expensive and tastes so much better than bouillon (hence the name). Pasta and Rice are a must. For pasta, keep penne, fettuccine and spaghetti on hand. I also keep wild rice, white and brown rice in my pantry. Beans – a good supply of beans (black, navy, pinto, kidney, garbanzo) goes a long way. Tuna Fish – for pastas, sandwiches and the delicious and simple tuna melt. Olives – what can't you do with olives? Keep several varieties for pizza toppings, pasta dishes and finger food. Dried herbs and spices are by choice, but a few I believe will make or break the flavor of your from scratch meals. I have garlic powder, onion powder, sea salt and pepper that I grind to season with. Try them, you will notice a huge difference in taste. Flour, baking soda, baking powder, salt and pepper (freshly ground) are also staples. A slow cooker is a wise choice also. I put the crock pot to good use in the winter. It is effortless to prepare a meal in the morning and dinner is ready and smelling wonderful when you and your family get home from school or work. In the crock-pot you can use cheaper cuts of meat and the slow cooking will tenderize it beautifully.